Of all the meetings I have attended, the one I'll always remember was hosted by the late Jack Valenti, longtime president of the Motion Picture Association of America. Of all the meetings I have attended, the one I'll always remember was hosted by the late Jack Valenti, longtime president of the Motion Picture Association of America. After welcoming our group he said, "I just want to take a moment to recognize that there are many talented executives around this table, and many of them are women." "This diversity was not always present. Collectively we are all better for it," he added. As a young communicator, I was touched to have the importance of women's professional contributions affirmed by a master of the trade. Today, as one of the few women to hold a top management position in the communications industry, I carry a different emotion when I attend meetings in the PR industry: a feeling of lost opportunity. Women may be rising in elective office and operating rooms, but when it comes to top leadership in our profession, women are still too often on the outside looking in. While women hold roughly three in every four PR jobs, men control 80% of the senior leadership positions. That's not just a glass ceiling: that's a thick cut, double-reinforced, opaque glass barricade. And it's coming at a cost, not only to our industry, but also to the organizations we represent. This is an age when cultural competence matters most. Diversity isn't simply about fairness; it's also a business opportunity. Those who pay attention to the demographic shifts will drive better customer connections and business outcomes. America is more diverse than it was four years ago, as we saw in the 2012 presidential results, where the Republicans won the white vote in all but four states, and still lost the election. In global markets, diversity is even more pronounced. In a study of 321 global enterprises, 85% of managers agreed that diversity is crucial to fostering innovation in the global economy. In all markets, communicators must now reach consumers with individualized messages that address a range of factors, from profession to race to socioeconomic background - and, yes, gender. Numerous studies show everyone benefits when deserving women ascend in corporate leadership. Goldman Sachs, Ernst & Young, and Columbia University have all established a link between the presence of women in senior management positions and corporate financial success. A key reason: while women don't necessarily offer a better perspective than men, we frequently offer a different one. The Boston Consulting Group recently found that US women control 73 cents of every household dollar spent. In an industry where understanding our customer is vital to success, we cannot afford to shut women out of the most important decisions. So what can we learn from what is working and what can women do to advance their own interests in the profession? We can begin by asking for the changes we want to see. When I was working in the agency world, men often advocated for themselves - for promotions or higher pay - while equally qualified women seemed more likely to accept the status quo. Women across our profession should use the same skills we use to enhance reputations and position products to sell our own brands. Data also shows that support systems can help open doors for aspiring executives - an easier path than crashing through ceilings. But while women are stronger networkers, studies show that men are better at recruiting mentors that can advance careers. Industry leaders should ensure that women are receiving the same support. Above all, we must make the case for inclusion. Diversity, from the communications suite to the boardroom, directly impacts the bottom line. McKinsey recently found that companies with the most diverse boards had significantly higher returns on equity and earning margins than those who do not. Gloria Steinem once famously said: "The truth will set you free. But first, it will piss you off." We need to channel our frustration over the lack of female representation in the top tier of our PR profession, to be better mentors, advocates, and voices for the value of women's leadership; not just to put more women in executive positions, but to make sure that our profession doesn't limp into the brilliantly diverse marketplace of the future, but reflects and leads it. 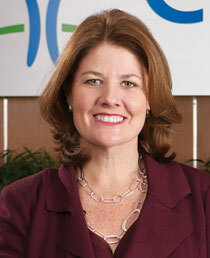 Maggie FitzPatrick joined Cigna in 2010 as chief communications officer. She also serves as president of the Cigna Foundation Board.